Driving continued growth and success for a national health organization. Our partnership with Mightybytes these past few years has been instrumental in helping NABP build out and grow its digital marketing practice. Their team keeps us focused on driving long-term results while delivering multiples projects and troubleshooting unforeseen challenges at a moment’s notice. It’s invaluable. The National Association of Boards of Pharmacy (NABP) relies on Mightybytes as a trusted partner. Here’s how since 2016 we have helped them build and grow a thriving digital marketing practice for continued success. Started in 1904, NABP protects public health by helping member boards of pharmacy across the United States. Their programs promote safe pharmacy practices that benefit consumers. As digital marketing efforts are relatively new to the organization, the NABP team knew they needed help aligning long-term organizational business goals with day-to-day tasks in a way that would show measurable results. We started our relationship with NABP by redesigning their website in 2016. Since then, things have blossomed. We now work across departments within the organization on a variety of projects. This positively impacts NABP’s ability to better serve its members and more easily provide value to the general public. Two style tiles created to drive the visual redesign of NABP’s site. Redesigning the NABP website in 2016 was our first project together. This represented a significant shift for the organization because content on the previous site was difficult to find for users and challenging for the NABP team to manage. For the first time ever, NABP had a suite of tools at their disposal that empowered them to continuously improve their digital marketing efforts over time. The website redesign, plus subsequent features and interface updates that followed, have not only helped the organization get clarity about who their users are and what they want, these collaborations have also streamlined how NABP measures their efforts and how they approach projects, shifting from a more traditional ‘waterfall’ process to one based on continuous improvement and measured success. Plus, several updates made the site more accessible to users with disabilities as well. Workshopping annual digital strategy with the NABP team. A digital strategy workshop, in which we helped them chart a course for achieving digital marketing goals throughout the year. A UX-driven feature planning workshop, in which we devised a roadmap to build and improve website features during the year. Exercises in these workshops included SEO 101, analytics and measurement strategies, creating proto-personas, goal mapping, hypothesis creation, defining design challenges, feature prioritization, and so on. We revisited the reports that came out of these workshops throughout the year to keep our work aligned with NABP’s long-term business goals. The Drug Disposal Locator helps users quickly find a verified nearby location to properly dispose of unwanted pharmaceuticals. Improper drug disposal can lead to many problems for people and the planet. They pollute water supplies and soil, causing adverse effects on nearby communities and wildlife. Plus, when drugs fall into the wrong hands they can cause serious health hazards if ingested. 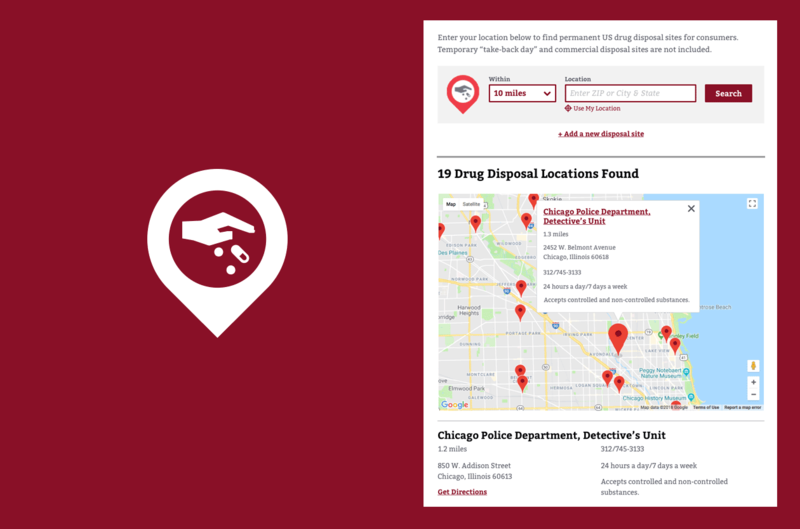 Mightybytes redesigned and improved NABP’s drug disposal tool to help users more quickly and easily find safe nearby disposal locations no matter which device or platform they use. The result is an improved user experience that simplifies the search process and generates more accurate results. Plus, the back-end data management system we built helps the NABP team easily execute administrative tasks, like removing duplicate location data. Prioritizing (and re-prioritizing) features and new projects based on continuous learning helps everyone stay focused on what really matters. The examples above are just some of the many improvements we have made for NABP, both in terms of processes and executed projects. Most importantly, the more closely we work together, the more iterative and data-driven each project has become. Regular website audits and analytics customization enable us to pull more meaningful performance data, which makes it easier to align long-term organizational business goals with what’s actually happening on the website. This has sown the seeds for building a more analytics-friendly culture within a very traditional organization, a monumental shift from how things were done previously. Our collaboration with NABP has helped the organization streamline internal processes, which saves them significant amounts of time and money. Through ongoing website improvements, their site is easier to use, especially for users with disabilities, and the organization is able to provide much better customer service. Most of all, we’re helping NABP transform how the organization employs digital tools and practices to improve their marketing and online communications over time.